The return of NFL football kicks into full gear this week and continues with a battle between the Washington Redskins and Baltimore Ravens. Preseason games are a time for teams to find out exactly who will be playing for them, whether it be specialists, rotational guys, or full time starters. Below, PFF’s team of analysts have all the most important position battles and players to watch during today’s game. This has been the most prominent position battle during Redskins camp. 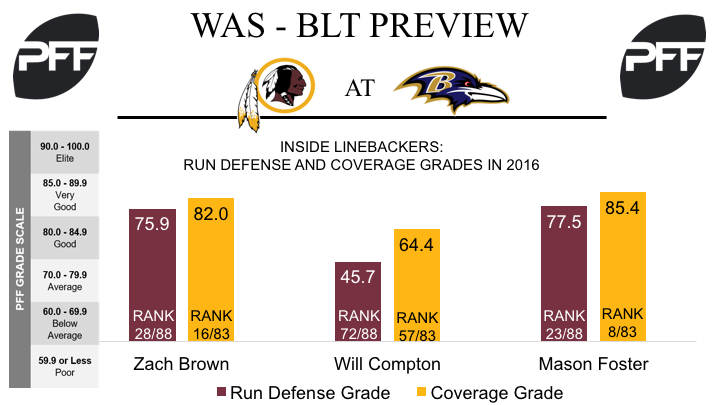 The Redskins have listed last year’s starters Mason Foster and Will Compton as the starters at the inside linebacker position, while free agent signing Zach Brown sits with the second team. Foster had a career year in 2016, ranking ninth among linebackers with an overall grade of 86.3. He led both his team and all inside linebackers in the NFC East in tackles (92), total stops (45), run stops (27) and run stop percentage (7.8 percent). Compton ended the 2016 campaign with an overall grade of 41.8, which ranked 76th of 88 qualifying inside linebackers. On his 936 snaps in 2016, he accumulated 33 total stops, which ranked 43rd, and he allowed a passer rating of 100.8 on throws into his primary coverage, ranking 44th. Compton missed 13 tackles on 93 attempts last year, giving him a tackle efficiency of 8.7, which ranked 47th of 64 linebackers with at least 165 snaps. Brown ranked 17th among 88 qualified linebackers with an overall grade of 84.0 last year. Brown’s 59 stops ranked third among all inside linebackers in 2016, and his 107 tackles ranked sixth. It’ll be the first time that we see Terrelle Pryor in a Redskins uniform, after an impressive off season showing in Richmond. 2016 was essentially Pryor’s first season at the receiver position, and he ended the campaign ranking 31st among pass-catchers, with an overall grade of 79.7. His had 132 targets in 2016, the twelfth most among the league’s receivers, and his average of 1.70 yards per route run ranked 34th of 51 receivers with at least 85 targets. He was especially productive in the redzone, and when targeting Pryor in there in 2016, quarterbacks achieved a passer rating of 120.8, the fourth highest mark in the league. The Alabama product will see the field for the first time as a pro, after he surprisingly slipped down the draft board to the Redskins at pick number 17. Allen played 746 defensive snaps in his senior season, where he was successful both against the rush and in the pass rush. He ended the college season with an overall grade of 92.1, the third highest grade among interior defensive linemen, and his pass rush grade of 93.4, which ranked first. 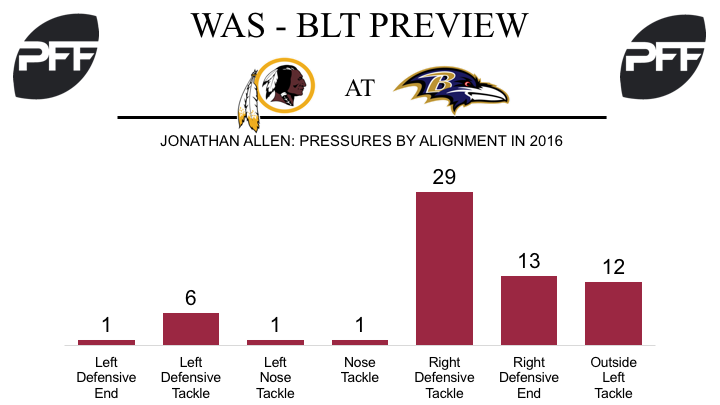 Allen has the versatility to line up and produce in any position on the defensive line, and in 2016, he recorded 67 total quarterback pressures, the most among the league’s interior defensive linemen. Of those 67 pressures, 37 came when lined up at defensive tackle, 28 came from defensive end and two came from nose tackle. The University of Oklahoma’s all-time leading rusher will want to impress early if he wants to dip into Rob Kelley’s early down carries. Perine had a breakout year in his 2014 college season, and ranked sixth among all FBS running backs in with a 100.4 elusive rating (the PFF metric that uses missed tackles missed and yards gained after contact to determine a runner’s success beyond the help of his blockers). However, his elusive rating has fallen every year since, to 79.2 (11th ranked) in 2015, and 55.4 in 2016 (36th ranked). With Dennis Pitta (810 snaps in 2016) now gone, the Ravens have several options at the tight end position, and the position battle will be worth monitoring throughout the preseason. TE Benjamin Watson (though coming back from injury) is the likely frontrunner, however the Ravens still have Maxx Williams, Nick Boyle, and have added TEs Larry Donnell and Ryan Malleck this offseason. 2015 sixth-round pick TE Darren Waller is suspended for all of 2017. Donnell was just recently signed by the Ravens at the end of July. Donnell earned the single worst grade for a tight end last season with a 36.4. He averaged just 0.85 yards per route run, fifth lowest among tight ends with at least 20 targets in 2016. He’s two years removed from his highest graded season, where he caught 4 of 8 targets of 20-plus air yards, tied for the seventh-most deep catches by a tight end in 2014. Boyle was the Ravens’ highest graded tight end in 2016, earning a grade of 70.6, though on just 116 total snaps. In 2015, Boyle earned a grade of 77.9 on 299 snaps, out-grading Williams (485 snaps) that year by 4.3 points. Between Boyle and Williams in 2015, Boyle had the higher receiving and pass blocking grades (74.8 and 71.7) while Williams had the higher run blocking grade (77.4). 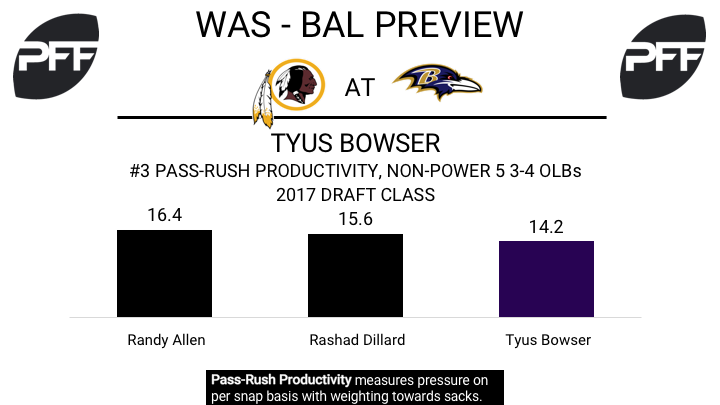 OLB Tyus Bowser has the chance to make a big impact as a pass-rusher for the Ravens this season. He was the fourth-most productive pass-rusher among 3-4 OLBs on non-Power 5 conference teams last season, as he generated 27 total pressures on just 155 pass-rush snaps. He’ll be put to the test against a Washington offensive line that allowed the second fewest sacks last season (13). Recently signed WR Jeremy Maclin is a player to watch for the Ravens. The 16.3 point grade drop from 2015 (82.3) to 2016 (66.0) might explain the Chiefs’ surprise release of the veteran receiver. We’ll be keeping a close watch to see if Maclin can still play at a high level; he had a career high drop rate of 12.0 percent last season. Struggling to stand out among Ravens running backs and following the loss of FB Kyle Juszczyk, Lorenzo Taliaferro has made the switch to fullback. While it remains to be seen how Taliaferro will be as a primary run blocker, he has always been a strong pass protector. He has yet to allow a single pressure on his 32 career pass blocking snaps thus far.